Description: All pictures posted in this folder were taken by Lynne Khan(Deceased). Description: Z Seattle-Chicago pulling out of the yard. note the steam cloud from the lead units radiators. they sat for 20 minutes waiting to leave and the snow accumulation from the wait is boiling off. Description: An Eastbound Z-train passes through the frosty landscape of central Minnesota. Description: The GAL departs out the 603 with a consist that actually made me care about the BNSF again for atleast a few seconds. Description: A BNSF freight coming off the NS Back Belt at Shrewsbury Rd, and will shortly begin its climb up the Huey P Long bridge over the Mississippi River. Description: Shot through my windshield. I wish I could have this one back, oh well...From looking back in my archive, I have caught the BNSF 1045 before..also through the windshield, this time in Cambridge http://nels1jac.rrpicturearchives.net/showPicture.aspx?id=2232451 what are the odds?! 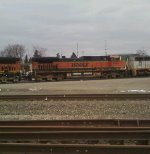 Title: BNSF Stored Engines Ready for Duty. Description: L CHI107 had a Dash 9 leading today. Im guessing the reason for this was the transformer load and they didnt want the train to stall at Douglas. Description: A pair of H1s lead a manifest west through Galesburg. Description: MVPX 1207, ex-CIRY SW9, coupled to a pair of BNSF Dash 9s at the CN yard. Description: In my opinion this is one of BNSF's best paint schemes. BNSF 1045 leads a north bound freight thru Old Monroe on BNSF's Hannibal Sub.